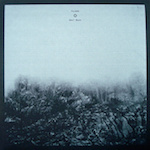 French/Portuguese duo Fujako team up with DC vocalist Black Saturn here to produce a sparse array of driving organic Dub/Hip-Hop that teeters on mechanical Industrial. The opening title track displays a clinical driving beat, that reverberates from a bygone era of cold waves that meld into the experimentalist Voltaire-like ‘A3-J*A*’ with consummate ease. Side B opens up with a maniacal echoing mass of tormented vocals that shatter above a sea of grinding bass and plodding rhythms, whilst subtle electronics slice into the mix; the net result is fundamentally urban and retro in nature, yet displays a direct modernity. The closer is a re-working of the opening ‘Soul Buzz’, tagged as the ‘dub’ version. Strangely enough this is even more experimental than before, capitalising on an era when Industrial music was in its infancy. Clattering beats and driving noise make an appearance throughout a visceral mix of abrasive, arctic cold atmospheres; and the outcome leaves the listener feeling washed out and desperate. Overall, Fujako are one of those unheard of surprises (for me anyway) that make you sit up and pay attention. ‘Soul Buzz’ achieves exactly what an EP should; and that is provide a brief emphatic taster, that initiates the listener to hunt down the artists back catalogue in eagerness to hear more.